Travel by rail has a certain romanticism to it, especially in film. But how does it compare to real life? Amtrak has a number of routes that service the Southern United States, hitting nearly every state, including Florida, Georgia, North Carolina, South Carolina, Virginia, Louisiana, Mississippi, and Alabama. It’s a good way to cover a lot of ground if you’re short on cash and have plenty of time. There’s certainly an appeal to being able to sleep, eat and drink, or just look out the window, not to mention no long lines like at the airport! There are multiple routes to take passengers around the region. The Auto Train transports vehicles from near Washington DC to Sanford, Florida non-stop. The Carolinian Piedmont train starts in New York and has stops in Washington DC and Raleigh before terminating in Charlotte. The Crescent runs from New York to New Orleans with stops in Atlanta, Charlottesville, Greenville, Hattiesburg, and many other places. The City of New Orleans runs from Chicago to New Orleans with stops in Memphis, Greenwood, and Jackson. The Northeast Regional train starts in Boston and services much of Virginia, including Lynchburg, Richmond, and Williamsburg before ending in Newport News. The Silver Service/Palmetto starts in New York but makes stops in Washington DC, Charleston, Savannah, and Tampa before ending in Miami. The Sunset Limited departs from New Orleans and stops in Lafayette and Lake Charles before crossing west into Texas, ending in Los Angeles. Train tickets vary in cost depending on the route and type of seat, but most routes offer a coach class, business class, and sleeper suites. For example, my ticket from Atlanta to New Orleans one way in the main cabin was around $70. Sleepers cost around double but are ideal for long journeys and overnight trips. There are also multiple types of fares for these classes that change depending on when you book. Tickets can easily be purchased online or in person at the station as well as on their app, which is compatible with Apple Wallet. Tickets are checked a few times on board so keep it with you. You can also reserve a seat, but it’s not required. With the train, you can also check bags like you would on an airplane. Seats have plenty of legroom and recline. They also have a tray table, a reading light, and plentiful electric outlets. There is free WiFi that actually works but don’t try to download large files. Carry on bags can be stored in the overhead bins or at your seats. Sleeper cars come with fold-down beds and sometimes have their own bathrooms. They also include meals. I had breakfast before boarding and brought a sandwich with me for lunch. I did buy a coffee on board, which wasn’t great but was available in the dining car, which has basic items like sandwiches, chips, and drinks. Some trains have better food options than others, including full-service dining cars. There are bathrooms at one end of every car, which are basic but clean. A valid ID is necessary to ride Amtrak and you’ll be required to go through a metal detector. When packing, keep in mind that you should keep any essentials like medications on you. Wear layers as it can get cold in the car. There is no entertainment on the trains, so you’ll need to bring your own books or computer. I also recommend bringing a few snacks and a water bottle as there isn’t time to grab something at the stations when they stop. It is recommended that passengers get to the station at least 30 minutes in advance. Sometimes the trains stop in the middle of towns and other times they go through central stations like Union Passenger Terminal in New Orleans or Union Station in Washington DC. Be sure to check the station location before you go. Also, note that some stations are 24 hours with vending machines and storage while others are little more than a platform. 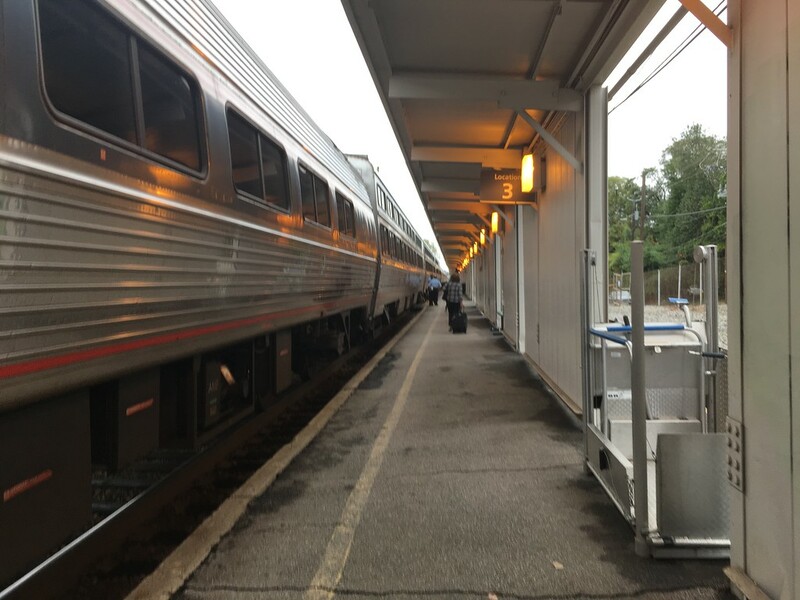 Have you thought about riding Amtrak in the South? This website is not a booking agent or affiliate of Amtrak, so please direct your questions to the official Amtrak website. This post simply details my experiences as a traveler using the rail service in the region.